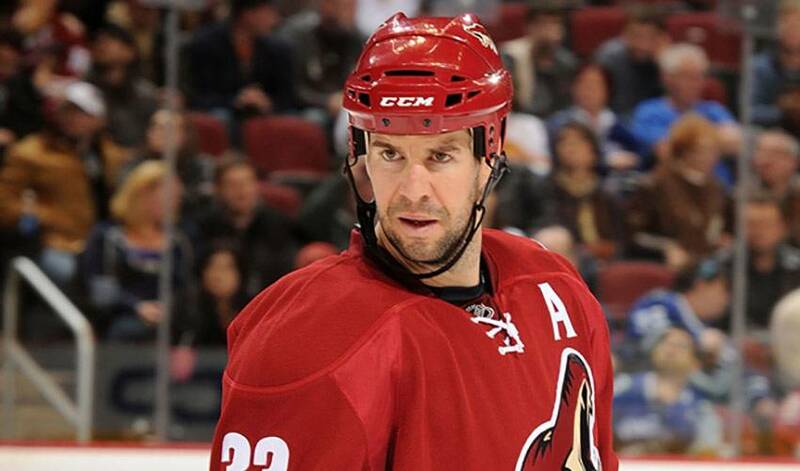 Adrian Aucoin is used to all the questions regarding the legitimacy of the Phoenix Coyotes as a playoff-worthy club. But the veteran defenceman, who is approaching an impressive personal milestone, is confident he and his teammates have all the right answers. Pundits didn't expect much from the Coyotes for the 2009-10 NHL season. In fact, there was little, if any, talk of Phoenix making the playoffs. The players, however, felt confident in what they could achieve. “I suppose we epitomize what teamwork is,” said Aucoin, who is less than 10 games away from hitting the 1,000 plateau at the NHL level. That was never more evident than last season. On March 27, 2010, the Coyotes clinched a playoff spot, their first since the 2001-2002 season, and in the process, reached the 100-point mark for the first time in franchise history. Their first-round opponent in the 2010 Stanley Cup Playoffs was the Detroit Red Wings. The Red Wings won the series four games to three, but in spite of the loss, the Coyotes proved they could skate with some of the Western Conference's elite clubs. But would they be able to carry that momentum into 2010-11? A sluggish start didn't help bolster their reputation as a team on the rise, but an extended mid-season win streak changed their fortunes and showed Phoenix was no one-hit wonder. Aucoin, who has also played with the Canucks, Tampa Bay Lightning, New York Islanders, Chicago Blackhawks, Calgary Flames, can point to any player on the roster and speak highly of their contributions. And while the hockey world has only recently taken notice of Yandle, Aucoin knew he was something special early on in his days in Phoenix. The same can also be said of Martin Hanzal, the Coyotes' first-round draft pick, 17th overall, in the 2005 NHL Entry Draft. Standing 6'5”, the strapping centreman is often charged with keeping the opposition's top players in check. As for his own contributions, Aucoin is simply doing what he always has: providing solid defensive play and consistency on the blueline. It's hard for him to even fathom the thought of playing in 1,000 NHL games. “I played for a pretty good minor hockey team and I think a lot of us dreamed about playing in the NHL,” he recalled. “But I wasn't so sure. And when I finally did make it, I really didn't have any thoughts on what my career would be. I felt lucky to play with and against great players. And as time went on, you become more comfortable and more confident. With a junior gold medal to his name – he was assistant captain on Team Canada's 1993 squad – Aucoin is hoping to strike silver by adding a Stanley Cup to his list of accomplishments. Getting that opportunity, however, isn't exactly a given. Which is why you don't have to remind Aucoin that every game is an important one.